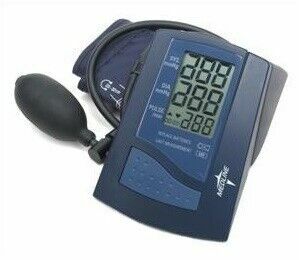 Manually inflated digital blood pressure units have the convenience of a large, digital readout. Also provides accurate and reliable readings. large digital readout and memory. Units come with a Standard Adult Cuff that fits arms 22-30 cm, 8.66" - 11.80"
Units come with a Large Adult Cuff that fits arms 30-38 cm, 11.80"-14.96".